How does the mechanical system work? No gas is used when the engine is idling. A hose is connected from the regulator to the air intake between the air cleaner and the turbo. When the engine load increases, the turbo creates an increasing vacuum in the air pipe. This vacuum activates the regulator to begin supplying fuel. As the engine load continues to increase, the vacuum continues to increase, causing the regulator to supply more and more gas. A flow control valve in the fuel vapor line controls the overall fuel curve. A dash mounted switch turns the unit on and off, and it also turns on and off with the ignition switch. 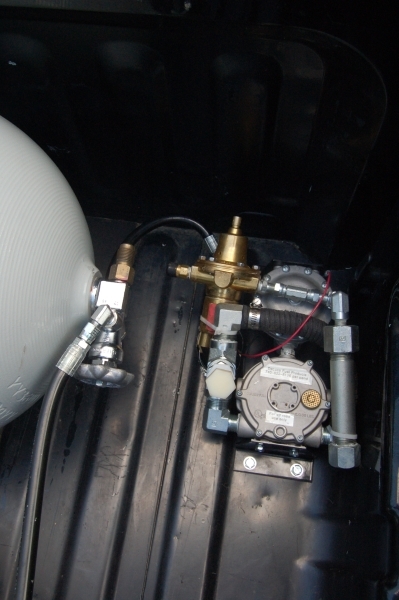 If running propane, the unit draws liquid propane from the tank to eliminate pressure loss due to evaporation within the tank. Consequently, the unit is water heated and is connected to the cooling system. The kit includes all necessary hoses and hardware to make this connection. 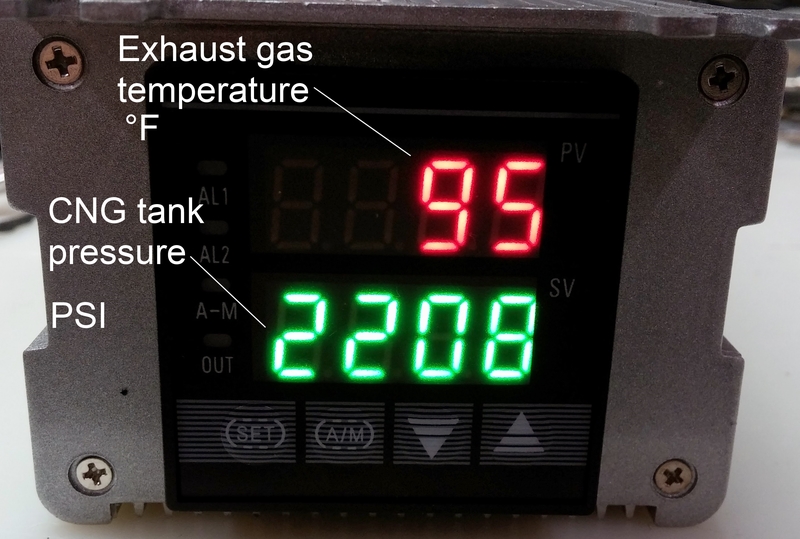 An optional digital exhaust temperature gauge with programmable gas cutoff is available, as well as a digital tank pressure gauge. Operation on a GM Duramax has given as much as 60 miles per gallon of diesel fuel. At this consumption rate, the propane consumption was approximately 20 miles per gallon. Another great benefit is that it will add up to 100 rear wheel horsepower. CNG, (compressed natural gas) is also available to supplement diesel fuel for turbodiesels. Comparable results to propane have been achieved. Below is a photo of a system on a pickup truck. This is a combination EGT/tank pressure gauge. Bottom gauge can display PSI, % remaining in tank, or gallons remaining in tank.